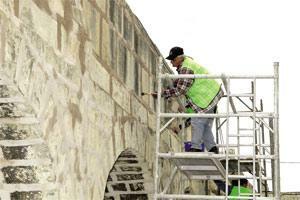 The restoration work on the Wignacourt Aqueduct in Santa Venera is expected to be completed shortly. The restoration work on the Wignacourt Aqueduct in Santa Venera is expected to be completed by the end of this month, three months earlier than expected. Resources and Infrastructure Minister Ninu Zammit, who visited works on the aqueduct, said work will now start on the upgrading of Hastings Gardens, in Valletta. The aqueduct restoration project, which started in May last year, was undertaken by the local councils of Santa Venera, Birkirkara, Balzan and Attard in conjunction with the ministry. The councils committed themselves to pay for the materials used while the ministry provided the workers to carry out the job. The total investment amounted to Lm140,000, half of which went towards the workers' wages.